Enabling a Digital Life...: Fulfillment First…! Fulfillment: How an effective fulfillment imprints a positive impression on the consumers. First: A “first” I achieved. Fulfillment First: The importance of placing the fulfillment strategy before anything else… if your grand plan does not ensure effective fulfillment to your consumer then, what was the plan? 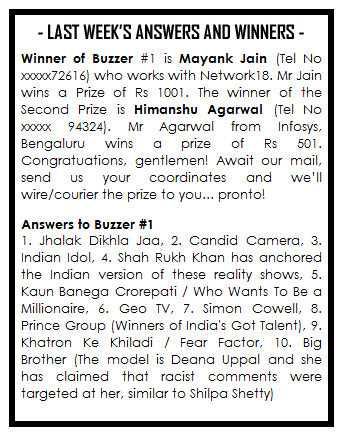 Friday, 20 July 2012 – MxMindia launches the first edition of MxMIndia’s weekly media quiz, titled “Buzzer”. First prize INR 1001 and second prize INR 501 to be won every week. Sunday, 29 July 2012 – …I received a mail from Mr. Maheshwari formally informing about winning the second prize and a cash cheque for INR 501. Now comes the fulfillment part… I was given two options, either provide my address and get the cheque couriered on the said address or provide my bank account number, name, and branch for the cheque to be deposited in the said account, for instant gratification. How do I know the cheque will be deposited…I read the next line of the mail…"we’ll email you a stamped receipt…”. Now, that wowed me! Monday, 06 August 2012 – As promised, I received the scanned copy of stamped receipt. The overall experience just awed me. I was kept informed at each stage after being declared a winner with proactive communication from the contest organizer. MxMIndia realized that winners can be across India and accordingly their choice of prize(s), ensured easy and speedy fulfillment. As I opined in my earlier post, 15 Minutes of Fame…Reloaded!, I am happy with both the value and satisfaction delivered by the cash prize and instead of someone else deciding on the winner’s behalf, I am happy to choose for myself with the prize money. 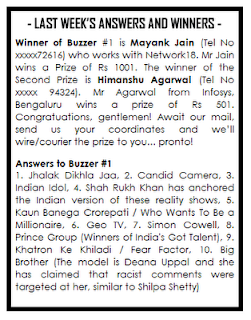 Wishing loads of success to MxM Buzzer and hope that it keeps buzzing for times to come!